Over the last twenty years the Journal of Historical Sociology has redefined what historical sociology can be. These essays by internationally distinguished historians, sociologists, anthropologists and geographers bring together the very best of the JHS. Volume 1 focuses on the British state, Volume 2 on the journal’s wider interdisciplinary challenges. The second in a two-volume anthology representing the best articles published in The Journal of Historical Sociology over the last twenty years. Includes essays, debates and responses written by internationally distinguished historians, sociologists, anthropologists and geographers as well as by pioneering newer scholars have been influential in challenging and redefining the field of historical sociology. Spans a range of issues and topics that combine rich empirical scholarship with sophisticated theoretical engagement, bringing together the very best of the JHS. 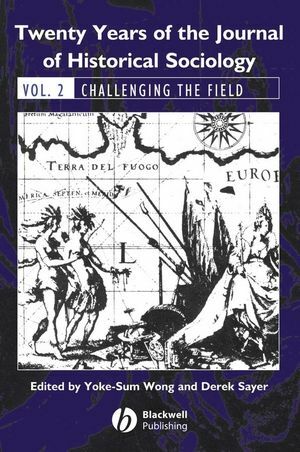 Challenges the nature of undertaking interdisciplinary work within history and the social sciences. A wide exploration of the historiographical, taking us beyond Europe and often highlighting unconventional approaches to the disciplines. Yoke-Sum Wong is a Lecturer in Sociology at Lancaster University, UK. Derek Sayer is Professor of Cultural History at Lancaster University, UK. He is the author of ten books including The Coasts of Bohemia: A Czech History, Capitalism and Modernity, and with Philip Corrigan, The Great Arch. Includes essays, debates and responses written by internationally distinguished historians, sociologists, anthropologists and geographers as well as by pioneering newer scholars, which have been influential in challenging and redefining the field of historical sociology.